Now playing at the American Theater Company! The actor, agitated and antsy, ably transports us to a world of hurt and desperation. Milligan plays Joe, who owns an auto-body shop and is a big Rush Limbaugh fan. Joe is steadfast about his red-state political beliefs until his wife is stricken with cancer and loses her health insurance. The two lose their home. The only way for them to make her medical care affordable is to divorce. He does more than that, which explains his current dilemma. Joe is being questioned in a basement room in an Ohio police station. The officers are offstage, somewhere in the audience. But we are less his interrogator than witnesses to a sad story. Dressed in layers of dark clothes that include a coat and a hoodie, Milligan’s Joe looks like someone who may have to sleep under a bridge. Milligan wrote the 60-minute play, which was a success in the New York Fringe Festival and is touring the nation. 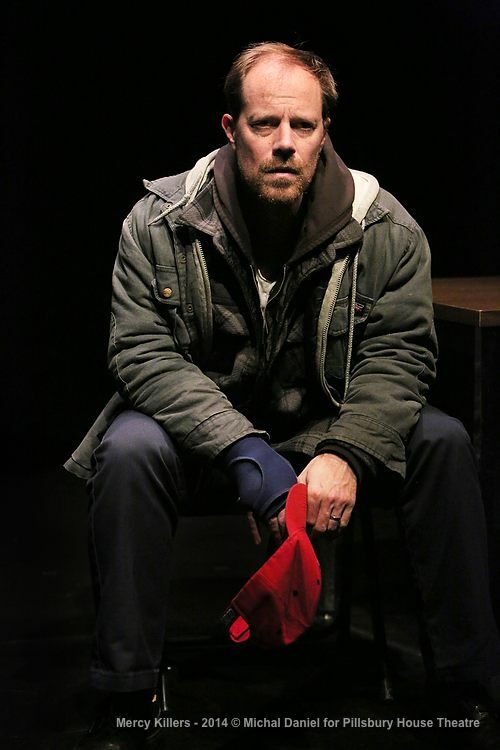 Directed by Tom Oppenheim, the production is equal parts agitprop theater in a venue known for socially engaged works and a vehicle for Milligan to show his theatrical chops. Milligan has had roles on Broadway in “August: Osage County,” “La Bête” and “Jerusalem.” Under Oppenheim’s guidance he invests Joe with intense physicality, even as he shows glimmers of tenderness. The story is told as much with gestures as with words that come flying out like flushed birds. Even his incomplete sentences are telling. When he recalls the vows he and his wife made to each other, he emphasizes the verb and leaves out the traditional last word. “Till death do us,” he says, pausing. This play is a raw, topical piece that shows the collision of ideals and reality in a system where health and well-being go up against profits. It is a show that is very much of the zeitgeist. Read the entire review at Truth Dig. 5 Stars, The Scotsman. Edinburgh. There’s a marvellous and mysterious kind of alchemy at work in author and actor Michael Milligan’s mesmerising, harrowing indictment of US healthcare. Not only is it theatre distilled to its most basic essentials – one ordinary individual telling his story, as if to an invisible interrogator, his only props a table and chair – but it’s unambiguously specific in its objectives: to attack a system responsible for more than 60 per cent of US personal bankruptcies, within which most of those driven to this last resort had health insurance when their medical problems began. It’s also patently fuelled by profound outrage, and yet all these elements are so skilfully and meticulously controlled, in both the writing and performance, so thoroughly transmuted in service of storytelling, drama and characterisation, that the effect is gripping first and foremost on a painfully human level, even as Milligan simultaneously delves beneath the foreground issues to the personal and national philosophies underlying the debate Stateside….